An inhaler can be a life saver during an asthma attack, but natural asthma treatment is also a highly effective option for long term asthma relief. Not only is natural treatment of asthma better for your body, but it can reduce the frequency and severity of asthma attacks tremendously, sometimes down to nothing. It’s so empowering to get rid of your asthma symptoms – the shortness of breath, the coughing, wheezing and tightening of your chest, the sensitivities to your environment, the rapid heartbeat and exhaustion. Asthma relief. Puffers or inhalers can provide immediate relief, but naturopathic care achieves long term relief with the use of herbs, supplements and acupuncture. The atopic triad. Those that suffer from asthma often have 2-3 symptoms from the atopic triad, which includes asthma, eczema and allergic rhinitis (hay fever). A naturopathic doctor will find the root cause and treat that. Food intake. Depending on the patient, certain foods such as wheat, gluten, dairy, soy, red meat and even corn may trigger asthma. A diet elimination technique can help by removing those foods that induce your asthma symptoms. 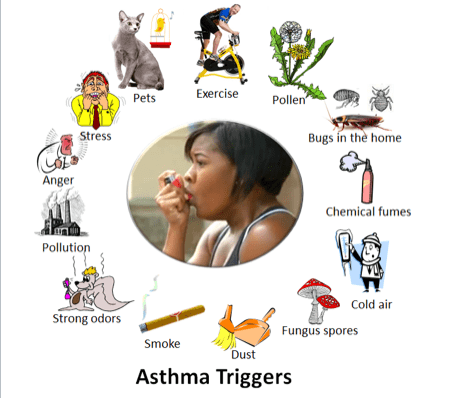 Other causes of asthma. Asthma may also be triggered by imbalances in the digestive system and the immune system. Chronic stress can also affect the body and contribute immensely to asthma. Naturopathic care seeks to identify the root cause by looking into the patient’s medical history. Impact of your birth and early childhood. I actually had asthma until I was about 10 years old, so it’s something that I’ve experienced for a decent chunk of my early childhood, and it’s interesting to explore the role that your birthing process, or what happened around the time of your birth, would play into it – whether it was a conventional birth or whether it was a C-section, whether you were formula-fed or breast milk-fed, and the degree of stress that was in the household around that time. If you’re looking for asthma treatment, contact our receptionist at 416-792-4400 or by using the form below and she will book you for a FREE 15-minute phone or in-person consultation with one of our practitioners.